Eastern in the 1950’s-1960’s era wanted to expand its routes. Any airline at that time had to apply to the CAB for route authority or merge with another airline, which is what Eastern chose to do. Eastern merged with several small airlines as we all know, such as Colonial Airlines (gave them authority to fly to Toronto and Montreal, and Washington) which was a very lucrative move for business professionals, and the Bermuda route. Then they merged with Caribair Airlines (gave Eastern, Puerto Rico and the Dominican Republic). Eastern made very smart moves to acquire fantastic routes. Eastern being an airline of firsts wanted more routes, so they merged with Mackey Airlines. That was a tremendous move for Eastern as Mackey International Airlines out of the Fort Lauderdale airport carried certification as an International Airline making Fort Lauderdale, FL an International Airport. This proved to be very profitable for Florida because it gave Eastern access and a hop, skip & a fly away to the Bahamas! This merger also gave Eastern the opportunity for more visitors to use their aircraft to fly into Ft. Lauderdale Airport, Florida to catch a vacation to the Bahamas and to the Caribbean. What Floridian or visitor to Florida didn’t want to vacation in the Bahamas? Eastern was on target as the Bahamas proved to be a great destination and brought additional revenue to Eastern! In addition, the merger gave Eastern a perfect route of Jacksonville, Tampa, West Palm Beach, Ft. Lauderdale, Miami, West End, Freeport, Bimini, Nassau, Andros Town, Green Turtle Cay, March Harbour and the Harbour Island. More revenue! 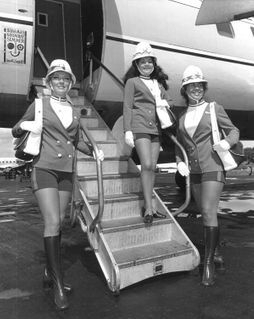 The Mackey Airlines Stewardess that flew and took care of passengers back then had a wow uniform. Don’t you just love their uniform? "Colonel Joe," the original founded who started Mackey Airlines on September 30, 1946, was Joseph C. Mackey, a former stunt pilot and United States Air Force Colonel, thus the nickname that followed with him. He began Mackey Air Transport 1946-1953 and it became Mackey International Airlines with routes from Fort Lauderdale, Miami and West Palm Beach to the Caribbean and Cuba. “Colonel Joe” based Mackey International Airlines out of the Fort Lauderdale airport. There were two other air carriers in the U.S. that earned certification as an International Airline at that time. Eastern Airlines in 1967 bought out the original Mackey Airlines and as part of the Eastern Airlines buyout, Colonel Mackey had agreed not to operate another airline for 5 years. Once the sale was over “Colonel Joe” started Mackey International Airlines with headquarters in Ft. Lauderdale, but the Airlines lasted only ‘til 1981. Joseph Mackey was inducted in 1982 into the Aviation Hall of Fame. 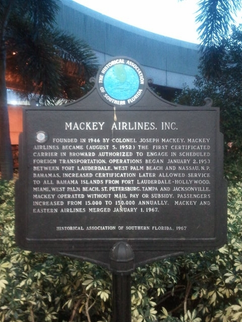 Founded in 1946 by Colonel Joseph Mackey, Mackey Airlines became (August 5, 1952) the first certified carrier in Broward authorized to engage in scheduled foreign transportation. Operations began January 2, 1953 between Fort Lauderdale, West Palm Beach and Nassau, N.P. Bahamas. Increased certification later allowed service to all Bahamas’ Islands from Fort Lauderdale Hollywood Airport, Miami Airport, West Palm Beach, St. Petersburg, Tampa and Jacksonville. Mackey operated without mail pay or subsidy. Passengers increased from 15,000 to 150,000 annually. Mackey International Airlines and Eastern Airlines merged January 1, 1967.